I think that the easiest way to tie all of the Hux coup hints, Kylo needing to perform a selfless act by choice, etc together would be for Hux to not perform an overt coup, but for Hux to force Kylo's hand. If there's a situation where Hux is going to obliterate the Resistance (including Rey) or something like that...and Kylo becomes aware of that, Kylo is then given the choice of doing nothing, where he'd retain Supreme Leadership and allow Rey to be killed...or he can intervene, save Rey, and probably sign his own death warrant as a traitor. That scenario leads both to a selfless sacrifice by Kylo and effectively carries out the coup that was foreshadowed in TLJ. If this happens in Act 2, then there's even enough time for Kylo to temporarily side with the Resistance to get the actual Evil Dictator (Hux) out of power by the end of IX. I think that is the beauty in this forum, in that everyone has their various ideas from every which angle. No matter how it ends up being portrayed in IX, I love that we can all take the time to share in this experience. Very fortunate to be here, reading and sharing in our mutual appreciation for the Reylo concept. As for whether it is something big that happens to make him "turn" or a build up, at the moment, I guess I wouldn't mind it being the case of something big happens but he is still on the fence, and then something almost introspective happens that pushes him over the edge, a little closer to the light, and is propelled from that "warmth" and Rey to do the right thing that might end up benefiting both sides, whatever crazy concept that might end up being. 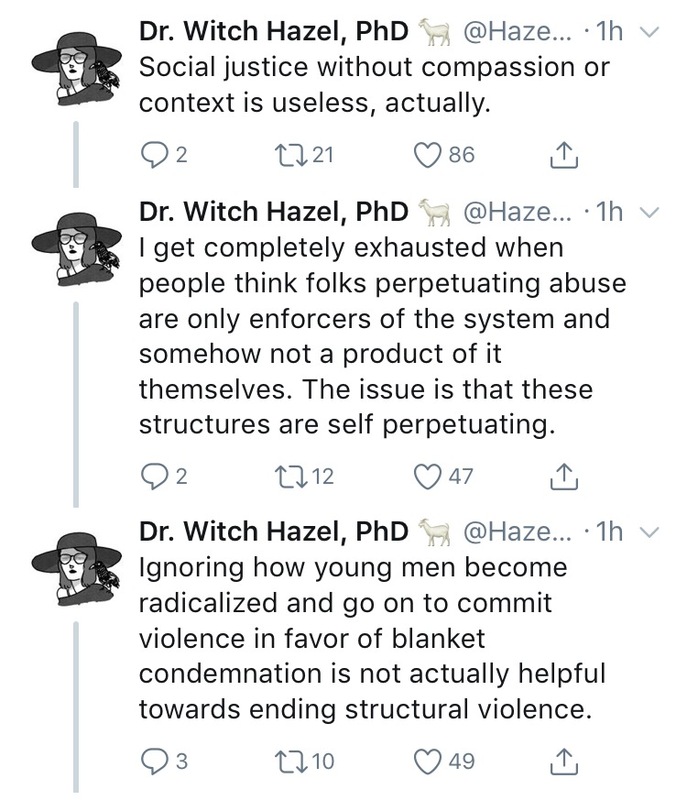 I consider tantrums to be outbursts of emotions, uncontrolled anger, throwing around things and destroying stuff without specific purpose as a way of venting because one isn’t able to process their emotions and feels no control over their life and hence is frustrated beyond any measure. It often happens among small children, because it’s natural for them - they don’t understand everything yet and can’t control their emotional reactions - but not only as teens and adults too have them. The difference is, the older one gets, the more extreme circumstances need to appear for one to experience this. So for me, Kylo has tamper tantrums only in TFA - he destroys the control panel when he learns the droid’s escaped and then the walls of the interrogation room upon Rey’s escape. He’s angry, frustrated and unhappy - the said escapes aren’t the actual reasons for his outbursts, it’s the conflict within himself, the constant pull to the light he keeps fighting without any success and resulting suffering. Kylo’s constantly on the verge and it doesn’t take much for him to cross the line. But in TLJ when he destroys things and shouts, it’s something else - it’s rage directed at specific aspects of his life, appearing for a certain reason and having a specific purpose. When Kylo destroys his helmet, he’s just accepted what he’s known all along and realised Han was right too: that Snoke doesn’t care about him, that he’s using him for his power, that he’ll dispose of him. He’s also devastated because he killed his father and it causes him incredible pain and didn’t help him detach from the light - he considers it yet another thing he did for Snoke, and it’s not just any thing, but he receives nothing in return. All these thoughts must cross his mind when he calmly stares at his mask before he smashes it against the lift. So this isn’t just a temper tantrum, it’s Kylo realising he’ll need to re-consider his path and it clearly isn’t what he’s thought so far - hence the symbolic smashing of his helmet. He then goes on to kill the Resistance that he despises so much, when he sees Rey, he wants her to bring Luke to him - the man he seems to hate even more than the Resistance (rightfully so...). Kylo tells Hux to follow the Resistance and Rey to Crait to wipe them out, he’s mad at Rey for turning him down - he’s very calm when he orders the troops to advance, to take no prisoners - he’s disappointed and sad, but resolved and wants to erase this part of his life that hurts. His next ‘tantrum’ is when he confronts Luke on Crait, but it’s again rage at the person he despises for trying to murder him in his sleep and who’s been the turning point in his fall to the dark side and hence even more suffering. Notice Kylo’s facial expressions after shooting at Luke - it’s relief and then horror when it turns out Luke’s still alive. Summing up, no more tantrums in IX, but I think (and kinda hope, I like them ) outbursts of rage will happen - Kylo’s defined by his passion after all. As for general evolution of his character, for now I see two ways meeting at some point (once we get some database updates or vids, teasers, trailers etc. I’ll determine which way I find more likely): either it’s Kylo who’s still actively trying to get rid of the Resistance but upon each order feeling worse and showing sadness, some regret and even more conflict, or it’s passive Kylo who’s quietly analysing his life in his chambers completely alone and being quite depressed. Both ways I see coming to a point when he realises he’s screwed up too and that even though his father didn’t take it lightly Ben’s force sensitive and his mother was afraid of the darkness within him, they had little time for him, found other matters more urgent and didn’t help him in his struggle against Snoke in his early youth, even though his uncle distrusted him and, well, tried to kill him, he should’ve let go and rather abandon them and live his life than keep holding on to his past and pursue revenge. I see him kinda forgive his family and choose not to commit the acts of evil any more - instead, correct them. And this is basically the moment of his redemption because he doesn’t have to do anything wow so big and jaw-dropping (he might do later in the movie, though, it’s Star Wars after all). Somewhere around this time I expect Hux’s coup to further complicate Kylo’s life . @Let The Past Die wrote: I know this won't be a popular thought, but I'd actually like to see him in a mask again at least once, not because I don't want to see AD 's wonderful expressive face, but I like to see him striding around with it on, there's just something about him doing that, that sends shivers up my spine I do think it would show him reverting to hiding behind the mask, therefore keeping his moody thoughts to himself and therefore shutting himself off from everyone, which will just perpetuate his loneliness. I too would love to see a few scenes with masked Kylo - one, I like him masked and dangerrrous at times , two, I’d like a scene of unmasking again to show the contrast between his masked menacing persona with the unmasked vulnerable reality. The scene in TFA when he took of his helmet was one of the most important both plot-wise and in terms of audience reception of the whole film and its characters. People liked Rey, Finn and Poe, and were curious who Snoke was, but it was Kylo who was the topic of ongoing discussion - precisely because of that masked/unmasked contrast. And in TLJ, when Snoke orders him to take it off - boom - it was devastating to watch Kylo being so devastated. @Let The Past Die wrote: Kylo is used to putting on a mask, literally and figuratively, now the literal mask has gone, I I'm in two minds whether him striding around with a facade of confidence, but in private, sort of sitting with his head in his hands. Or just shutting himself away from everyone. In either scenario he is just a tormented soul after all that's happened. Yeah, my thoughts exactly! Also, I’d love a scene with masked Kylo giving some orders to Hux or stormtroopers in his full menacing mode and then taking off his helmet in his personal chambers and putting his face in his hands, maybe with a tear in his eye. And spending quite a lot of time alone rather than hanging out in the cockpit of the Supremacy/Finalizer/whatever’s left. I guess it depends on how much she’ll tell them regarding her involvement in taking down Snoke. She’ll definitely refer to him as ‘Kylo’ if she conveniently spares them the story of shipping herself to the Supremacy. But if she does tell them everything, she might refer to him as ‘Ben’, especially if she insists there’s still light in him or something. @giaciak2 wrote: Kylo, ​​in several points, urges Rey to accept and admit her past. For absurd it is just what he needs. Yeah, he keeps telling her that she should let the past die, that if she needs to, she should kill it, that it’s time for old things to die, that she’s holding on etc., but, well, he doesn’t act to his own advice - or misunderstands it (wants to literally kill his past). He helped Rey tremendously in overcoming her past, maybe Rey will be the one who’ll help him realise this... I do hope so at least . @Dar-ren19 wrote: I thought his “tantrums” were pretty much over by the end of TFA. In TLJ, what we saw was mainly rage. Same here! Look similar - shouting, destroying things - but different reason and different purpose. I see general audience who disliked Kylo previously now mostly liking him, understanding his character, sympathising with him and rooting for redemption (and reylo endgame ), but many fanboys and antis think that becoming the Supreme Leader = going full on dark, pure evil and of course no redemption, and reylo - what reylo!? However, to be fair, I’ve come across some fanboys liking Kylo now cos ‘he’s bad*** for taking down Snoke’. @ZioRen wrote: I will never stop finding this funny because nothing Kylo did in TLJ even TOUCHED the bad he did in TFA. And guess what, folks? Rey forgave him for that enough to cry over the smallest contact with him and then ship herself directly into danger just to help/save him and fulfill a future she saw herself having with him. 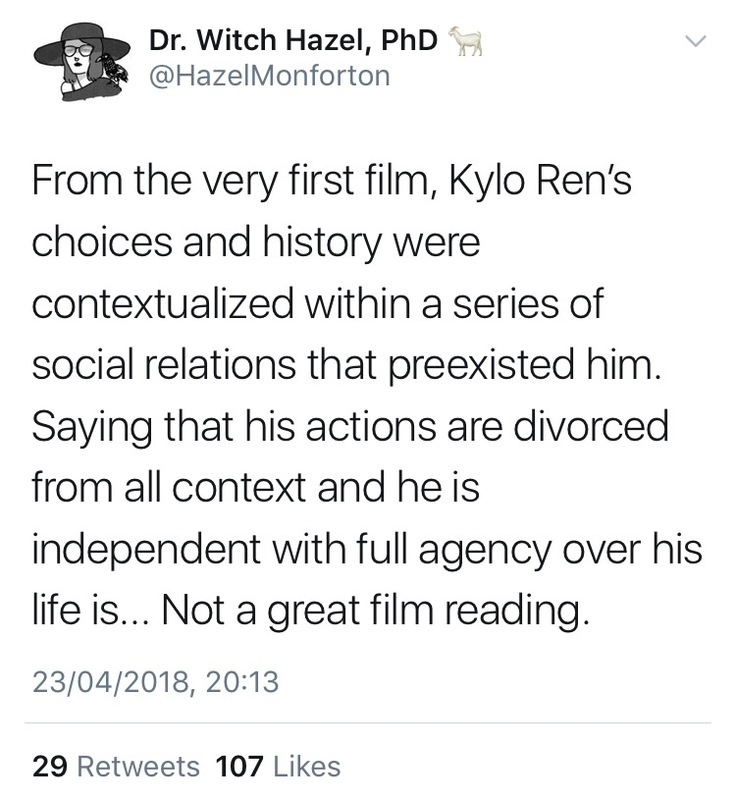 If Rey could get past that and if Kylo wasn't "Hitler" after killing his own father, why on earth do these people think he's too far gone in TLJ? Yes! I’ve seen antis say this so very often - Kylo killed Han, Rey won’t forgive him, definitely won’t fall for him and surely will chop his head off (after chopping off his hand). But in TLJ she’s already come to terms in this matter and actually started falling for him, so what they base these arguments on I have no idea . Also, yes, some resistance members died on Crait for sure, but that wasn’t anybody whom the audience would be emotionally attached to, so - to put it blatantly - nobody gives a damn. Regarding the story, it just means he’s done something bad and that he’s still in the dark. @ZioRen wrote: And oh yes, prepare for the pieces about Reylo "ruining" Rey and being rushed and ridiculous once their romance is finalized in IX. I already see people complaining that it makes no sense for her to empathize with Kylo as much as she did in TLJ and is "out of character" for her. 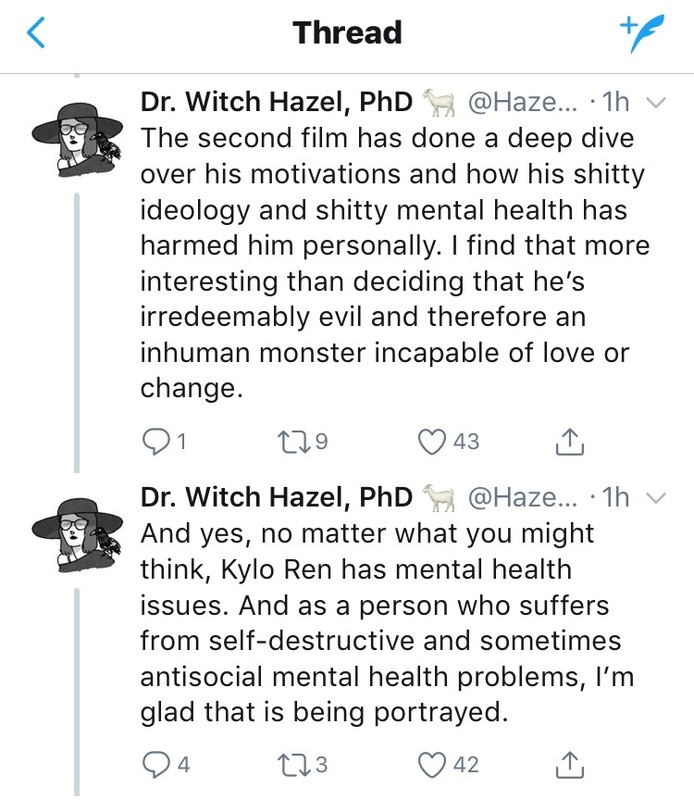 And this is funny too cos out of all people it’s exactly the heroes - the good and compassionate characters - who often are the only ones who see the leftover good in villains and hence are able to fall for them. They are the catalysts for the bad guys to realise their wrongdoings and begin their transformation. So if anyone, it’s Rey who’s most qualified to consider hooking up with Kylo. It would ruin Rey and be out of character for her to stop empathising with Kylo as he’s portrayed - it’d strip Rey of her compassion. @nickandnora wrote: Rey making some kind of huge gesture or sacrifice *for him*. If this happens, I have this idea that it will cause him to unselfishly "let her go" (back to whatever greater good she could benefit). Apart from Kylo letting his past die - coming to terms with it and forgiving his family - I think for a satisfying redemption and reylo endgame, he needs to let Rey go too - still love her, but accept the fact she turned him down. When he does that and stops being mad at her, it’ll show his feelings are truly selfless as opposed to somehow selfish (I write somehow as I believe he truly feels compassion for Rey since the beginning and treats her better in TFA and helps in TLJ out of good intentions, but during the proposal he uses the parents card in desperation and that itself is selfish). He might already go this way (puppy eyes at the end of TLJ), but we’ll see in IX. Me too! I don’t mind him re-considering his life and Hux committing a coup at the same time, but I’d prefer the coup itself not be the turning point. @Night Huntress wrote: I was thinking why people come to the conclusion he is even more eviler at the end of IX - even though he didn't really DO so much bad things compared to TFA. Yeah, I can’t comprehend why becoming a new Supreme Leader is supposedly worse than killing your own father, but oh well. @Night Huntress wrote: But the GA and many fans don't look into it so deeply. So for them his behavior is a sign that he is truly evil now. I think it’d be enough to show Kylo depressed or at least definitely conflicted at the very beginning of IX for those who are at least vaguely sensitive to grasp it, but who knows . @Mila95 wrote: I'm not sure he'll ever be all about the resistance tho,I think he'll end up helping them and seeing the first order as the big evil but that his motivation will always be tied to Rey and maybe making amends to his family rather than believing in their cause. Yeah, but I think this is enough, as a matter of fact I prefer this than him going full light and suddenly loving the Resistance and their ideals and so on. Actually, Rey also seems to help the Resistance because, well, it’s the right thing to do, and not because it’s her cause as much - she of course shares these ideals and admires their fight, but she values other things more (like her family supposedly coming back for her). And the fact that she bonds with people involved in the Resistance is crucial too. @Night Huntress He's such an overwrought hot mess in that part of the film, same as he was in the forest in TFA, that I wrote off everything he said b/c clearly he was having another breakdown. It *almost* made me feel sorry for Hux. I had figured that he would betray Snoke in TLJ because of the order to kill Han and his developing feelings for Rey. Especially because the conversation in TFA between the two of them where Snoke mentions Rey is beat for beat the Emperor in ESB telling Vader about "the disturbance" and "we have a new enemy." So I figured Rey was marked for death by Snoke at that point, especially with "bring her toooo meeee," which would be the motivation for his finally breaking/betraying his master. Renperer just seemed ridiculous, though I can see Rian's logic for going that route. But these type of "I don't see how he can overcome this" comments, it's like 1) Rey went from despising him to holding hands with him and shipping herself to him in a date night outfit. They had a bad breakup, but it's not over between these two. and 2) Have you seen Hux? Seriously, you think Kylo is the Big Bad with that guy breathing down his neck? Who has no remorse about destroying an entire solar system essentially of civil servants, shoots on unarmed transports, in one of the deleted scenes taunts Rose about destroying her homeworld, murdered his father, and has ambitions himself of being Supreme Leader? Kylo's got a far bigger problem with Hux than he's going to have with Poe and company. @ISeeAnIsland wrote: I think that the easiest way to tie all of the Hux coup hints, Kylo needing to perform a selfless act by choice, etc together would be for Hux to not perform an overt coup, but for Hux to force Kylo's hand. you're so brilliant. This is exactly how i see it. And the whole traitor thing... I think that's a really powerful nuance that's been Kylo's issue his whole life. The way he screamed "TRAITOR!!!" at Finn in TFA to me had a much deeper call to him and his life that we knew at the time. Who really is the traitor? Was it his parents against him/their only child? Was it Luke? Was it Kylo who basically also abandoned the light side and joined the dark? Who really is the traitor? I think Rey to him is more than what she thinks she is. She's the light that shows him the way back. @starliteprism - well said. I'm in total agreement. So fortunate to be here amidst you all. Haha. I genuinely love you all for your minds. HAHA! If this is how it goes I will be thrilled!! 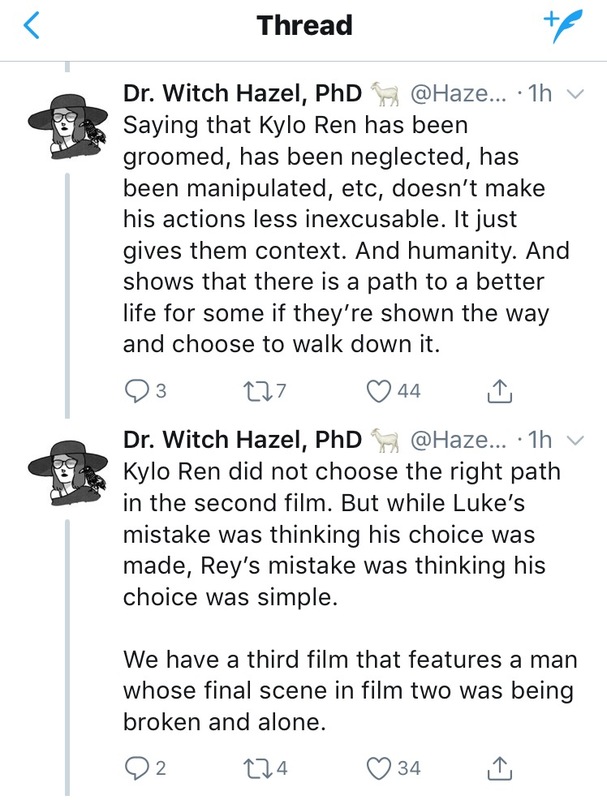 We already had Kylo/Ben choosing between following a dark path and Rey living in the throne room... but, the scenarios are slightly different as in TLJ Kylo/Ben had to refuse to act, and then act in a different way. Whereas in ISeeAnIsland's scenario- Kylo/Ben has to choose between doing nothing and acting. Hmmm.. actually the more I think about it the more I like it haaaa.. But! I also really like the idea of Kylo/Ben choosing Rey (and not being forced) and choosing to work against the FO from within.. This is a 'turn' that really is literally a turn.. In terms of storytelling, I think seeing Kylo/Ben 'turn' is a little obscure if the new force/balance paradigm goes down as I think it is hinting at - because there is no longer a dark side vs a light side - he won't turn to the light side - ever. Because there will no longer be sides. He will IMHO likely turn toward balance - which is not as easy to convey onscreen I think. A 'turn' against the FO, and seeing Kylo/Ben actively work within against the FO is very clearly a turn toward redemption. Some time for Kylo/Ben to set things up in order to bring them down from the inside could help along his case for a pardon! It would be a great way to convey that Kylo/Ben is making his own choices - and not just doing it because it's what Rey wants. He is really being marketed as a Solo, isn’t he? That's great, what do the pages say about Ben? The part with “embellished his feelings to trick her” made me lol. Embellished his feelings for her? Emo hair? @rawpowah wrote: Embellished his feelings for her? Emo hair? Yes, haven’t you watched the film, it was totally obvious. I took a two and a half hour bathroom break. Thank God Empire is here to enlighten me. Thanks for the upload! Yeah, "embellished feelings" ain't gonna make me buy the thing. Lmao honestly, it bothers me that magazine authors can't get Ben's characterisation right. It's just wierd... but then again I'm realizing how little people really can read signals and subtext. It's a wonder most people fall in love and get married! 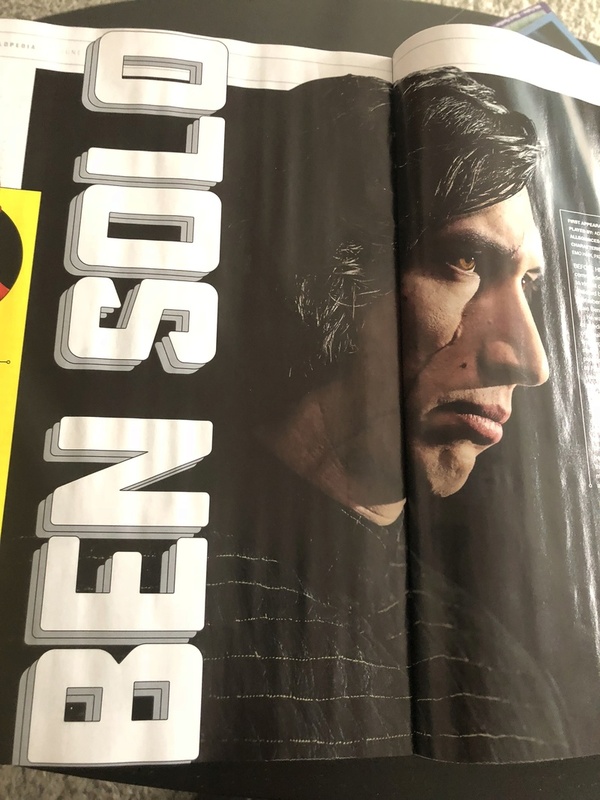 ‘Emo hair’ is enough to guess the author’s attitude towards Kylo and hence their perspective on his ‘darkness’ (and consequently chances of redemption and reylo existence/endgame). Is it frustrating? Sure it is. Does this surprise me? Sadly not really. 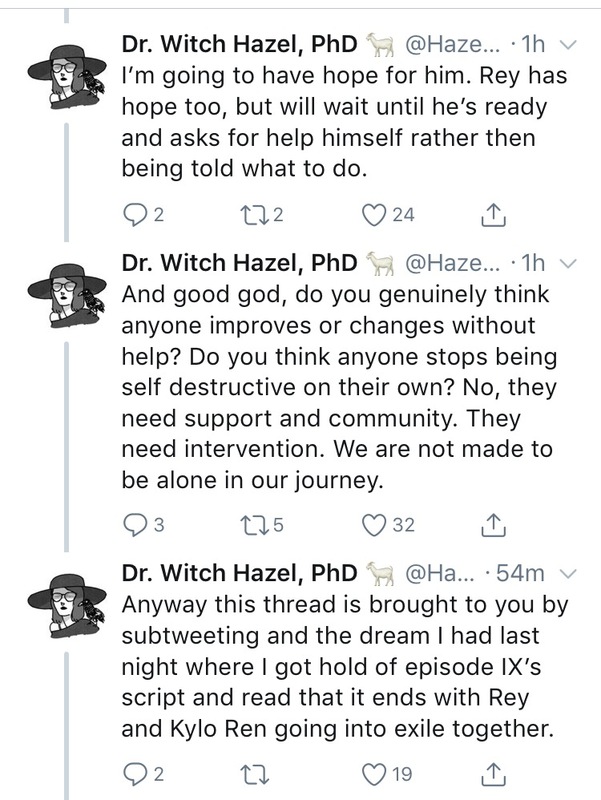 At least they acknowledged that ‘he wasn’t always bad’, which in the wake of recent tweets and posts from the ‘enlightened’ part of the fandom is good enough I guess? But the author also excused Luke’s actions - the way the attempted murder of Ben is described suggests Luke just felt a surge in the dark side and so instinctively took his sabre (as if in defence) rather than sensed darkness in Ben while reading his mind and so contemplated killing his sleeping newphew (a clear intent of murder). 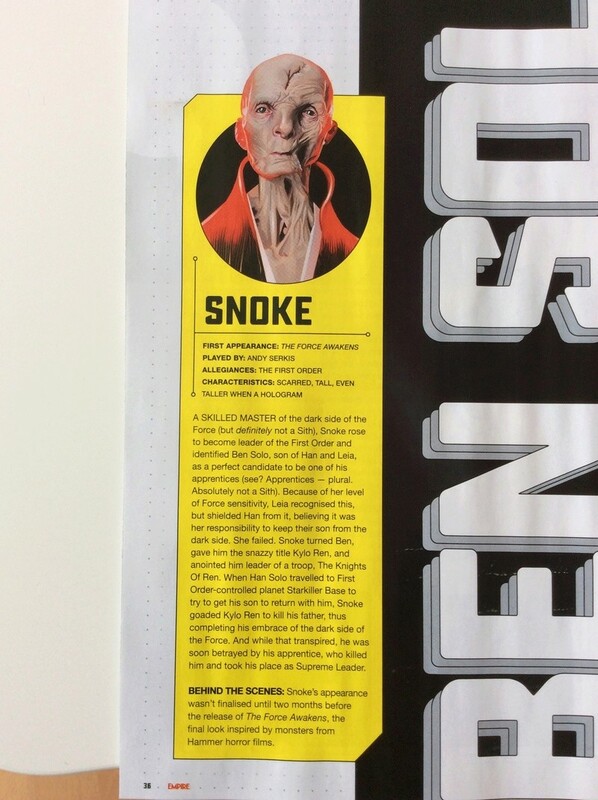 Lol did the writer take a bathroom break at the start of the film where Snoke basically spelled out that killing Han split Kylo's spirit to the bone? Kylo must have been embellishing his emotional state in front of his boss as well. I guess it doesn't matter if the movie explicitly spells things out, some people just keep on watching their own version inside their heads. 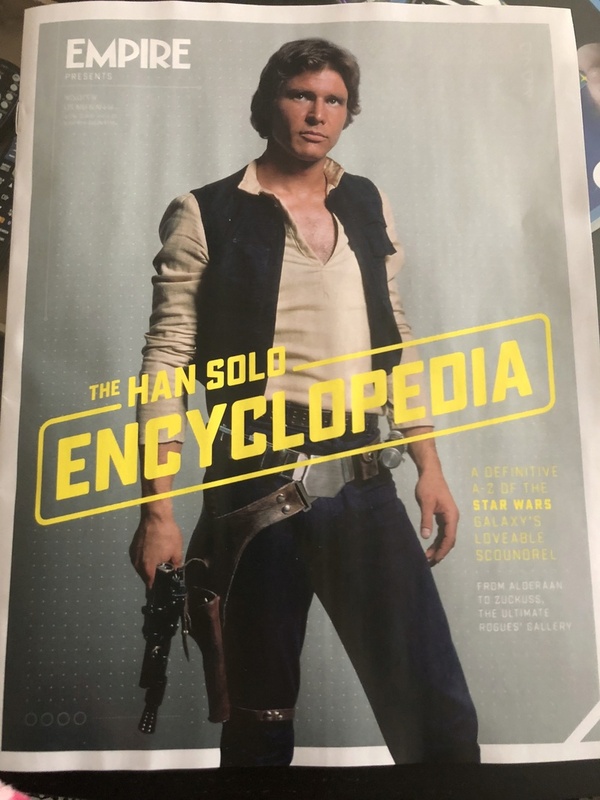 Since when was Han still a smuggler during Ben's childhood? I mean, with the events of Last Shot it's clear he wasn't staying at home being angelic all the time, but still... We know from Bloodline that later on he was a bigwig in racing circles. TFA clearly states that it wasn't until Ben fell to the Dark that his marriage with Leia broke down and they both went back to doing what they were "best" at. When I see errors like this (or writers starting off saying Ben is a Sith ), I just disregard the whole article. Why are people so determined to think Kylo was manipulating Rey when the movie spelled out in various ways that he wasn't? It's literally their headcanon with no canon support or basis that they're writing out as canon and it's baffling to me.